I Want to Invest In Your Apple Watch App. Here’s Why. To generate a billion dollars in revenue, Apple needs to sell 1,658,595 iPhones at an ASP of $602.92. To generate the same billion dollars in revenue Apple will only need to sell 58,824 watches at a $17,000 ASP. Benedict Evan’s analysis of the market suggests that tens of millions of watches are sold above the $1,000 price point with hundreds of millions more sold for $100–$1,000. Paying $17,000 for a watch may sound insane, but the US has 536 billionaires and 7,135,000 millionaires. China has 213 billionaires and 2,378,000 millionaires. People who are predicting that the Apple Watch will flop are dramatically underestimating the vast numbers of nouveau riche who just found the must-have new way to express themselves. Watch out LVMH and Richemont. 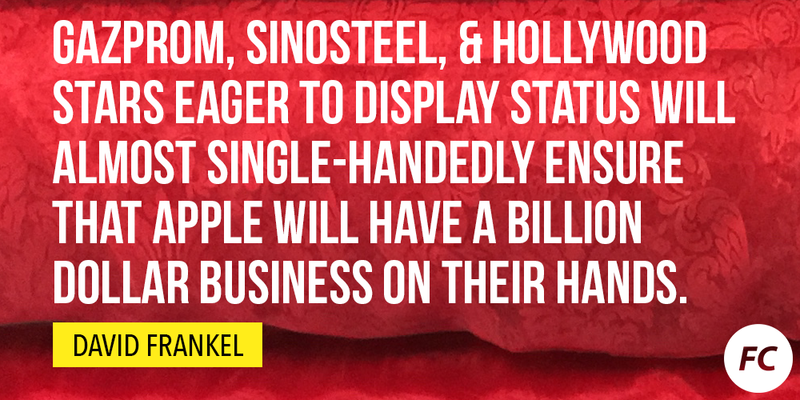 Gazprom, Sinosteel, and Hollywood stars eager to display status will almost single-handedly ensure that Apple has a billion dollar business on their hands. Don’t underestimate the power of metal. The Misfit Shine has been a major hit in a crowded fitness tracking market. Founder Sonny Vu ascribes part of this success to the fact that the device is made of metal and doesn’t look like a gadget. Apple amplifies this notion. Senior corporate executives who might have shunned a pink rubber step-counting bracelet may feel just fine with an ingot of rose gold on their wrist. They can also keep aware of alerts mid-meeting without rudely checking their phone. Younger generations have grown up in a watch-optional environment, but for those later in their careers watches were once the status symbol. A new watch was synonymous with a promotion or sale. A gold watch was appropriate for farewells after long length of service. Those social norms, paired with higher than average pricing might just render the Apple Watch the first major tech product that makes a dent among seniors and millennials simultaneously. Wilson’s piece makes a strong argument that the world isn’t ready for an Apple Watch. He likens it to a watch-like product recently launched at DisneyWorld where custom wristbands enable Mickey to address you by name and to unlock your hotel room door at the end of the day. Apple will most certainly not have this level of integration out of the aniline-dyed leather box. But this severely underestimates the power of Apple’s developer community. Companies in our portfolio are reporting that unless you’re working on a Watch app, the team in Cupertino doesn’t want to talk to you. Some worry that there is no compelling use case for the Watch that the phone doesn’t already solve. But many of the first popular apps for the iPhone were gimmicks. Remember shaking your iPhone to get a random restaurant recommendation? 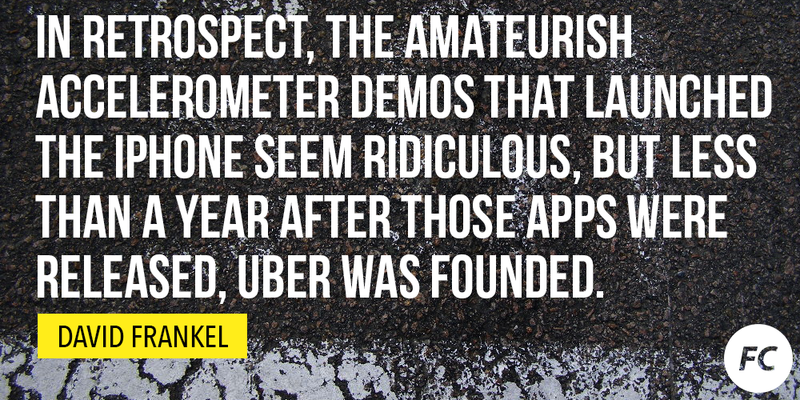 In retrospect, the amateurish accelerometer demos that launched the iPhone seem ridiculous, but less than a year after those apps were released, Uber was founded. On release, the PC, Mac and smartphone felt niche — available to the privileged few. The same naysayers who extrapolated the Creative Zen music player experience ahead of the iPod are back extrapolating the Pebble watch experience. “Smart watches are a tiny market” they declare. I agree with Chris Dixon that ResearchKit is a highlight of the new combined phone/watch capabilities. I also believe it’s just the start and that the global swathe of dedicated programmers developing for the the Apple Watch will continue to find more killer apps (they’re already hard at work). Christopher Mims, the brilliant Wall Street Journal tech columnist, wisely tweeted that smart watches are being willed into existence. But this is hardly a recent transformation. Instead it feels like a culmination of 15 years of positioning. Apple’s software design is unmatched, and even their much-maligned services are good enough. They have a distribution channel with millions of developers and their brand is trusted enough (by both brands and consumers) to draw an impressive array of market-leading launch partners. And if successful, their retail stores will seem like the smartest investment they ever made. BestBuy isn’t equipped to sell $17,000 watches. Most importantly, they have Jony Ive. For the last decade Apple has been building up Ive’s reputation as a craftsman, telling his story as the son of a silversmith, giving him lots of video launch time to explain every bevel on every bezel. I don’t think it’s an accident that the New Yorker and Vanity Fair, rather than any tech magazine, got exclusive interviews with Apple’s secretive style-definer. Apple’s iconic ads were historically about thinking different, but both Jobs’ in his time, and Ive’s of recent, have conducted masterful campaigns positioning the company as “craftsmen at scale”. They pore over curves like Louis Vuitton accentuates stitching. 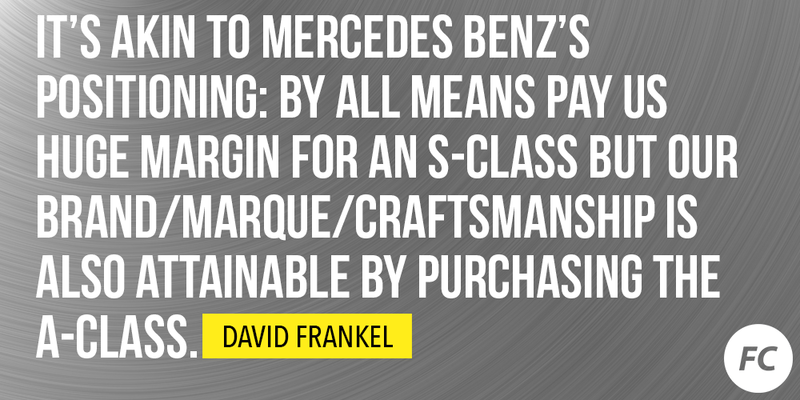 The watch is akin to Mercedes Benz’s strategic positioning: by all means pay us huge margin for an S-class but our brand/marque/craftsmanship is also attainable by purchasing the A-class. Attainable luxury at unimaginable scale. People grimaced on hearing that Apple will sell a $17,000 watch, but they would have guffawed had Google made the same proclamation. To give critics their due, there are many places Apple could stumble. Apple has a history of entering markets where there are OK, but not great products. Every techie in 2006 knew that putting the internet on a phone would be a game changer. Products like the Sidekick and Treo were tantalizing mirages. But it took Apple’s world-class engineers and ruthless tastemakers to make it a reality. The same with the iPod before it. But these were products that sprung up after, or in concert with, Apple’s invention of the personal computer. Contrast that with watches which have been worn since the 16th century. Watches are about reflecting personality. They are heirlooms. Jewellery. Statements. For at least 30 years now, function could easily be secondary. More than fixing broken products Apple fixes broken markets that have strong anti-consumer tilts. Consumers were sick of crappy Wintel Dell PCs designed to meet the needs of bulk purchasing IT managers. So Apple set a new standard for consumer laptops, sold directly to thought leaders, and took all the profit in the PC business. The phone market was essentially a conspiracy between handset makers and carriers aligned against customers until Apple broke through. The luxury market is different. It’s already filled with aspirational affinity brands. Rolex. Breitling. Omega. Cartier’s parent company, Richemont, has a $40bn mkt cap — solidly based on watches. In a weird way, Apple has a perverse incentive in this market. The Watch is already their most SKU intensive product line, but even with that ballooning complexity it can never satisfy every different customer need. While we settle for homogeneity in the world of phones, it’s unclear whether it can displace the emotional statement of wearing a watch. Time will tell, but if you’re down on Apple, try a little thought experiment and ask yourself what the watch could do if everything goes right for Apple? If you have a compelling answer, we’d be glad to set an hour aside to listen to it. 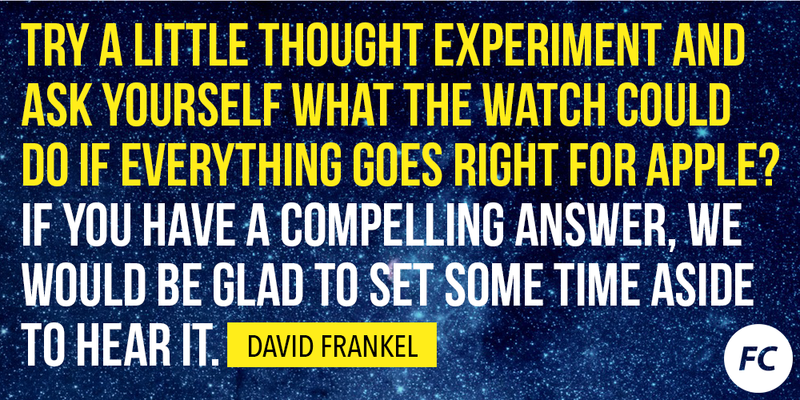 David Frankel is a Managing Partner of Founder Collective, an early-stage venture capital firm that has invested in companies like Uber, Buzzfeed, MakerBot, Coupang, SeatGeek, and PillPack. Our mission is to be the most aligned VC for founders at seed. #ProudInvestor in @Uber @TheTradeDeskinc @Buzzfeed @Cruise @Diaandco @PillPack @SeatGeek & more. Essays on Tech, Startups, and Trends from Founder Collective, a seed-stage VC firm that has invested in companies like Uber, MakerBot, Buzzfeed, & Hotel Tonight.